Mercury is the smallest and closest to the Sun of the eight planets in the Solar System, with an orbital period of about 88 Earth days. Seen from the Earth, it appears to move around its orbit in about 116 days, which is much faster than any other planet. This rapid motion may have led to it being named after the Roman deity Mercury, the fast-flying messenger to the gods. 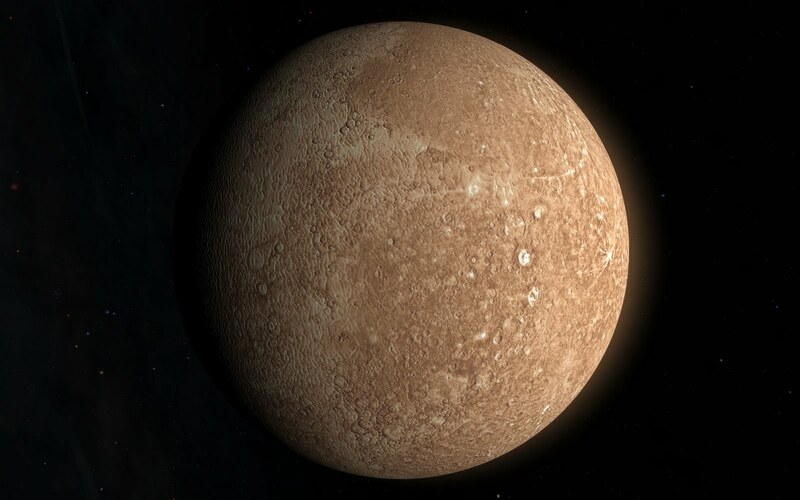 Because it has almost no atmosphere to retain heat, Mercury’s surface experiences the greatest temperature variation of all the planets, ranging from 100 K (−173 °C; −280 °F) at night to 700 K (427 °C; 800 °F) during the day at some equatorial regions. The poles are constantly below 180 K (−93 °C; −136 °F). Mercury’s axis has the smallest tilt of any of the Solar System’s planets (about 1/30 of a degree), but it has the largest orbital eccentricity. At aphelion, Mercury is about 1.5 times as far from the Sun as it is at perihelion. Mercury’s surface is heavily cratered and similar in appearance to the Moon, indicating that it has been geologically inactive for billions of years. Mercury does not experience seasons in the same way as most other planets, such as the Earth. It is locked so it rotates in a way that is unique in the Solar System. As seen relative to the fixed stars, it rotates exactly three times for every two revolutions it makes around its orbit. As seen from the Sun, in a frame of reference that rotates with the orbital motion, it appears to rotate only once every two Mercurian years. An observer on Mercury would therefore see only one day every two years. Because Mercury’s orbit lies within Earth’s orbit (as does Venus’s), it can appear in Earth’s sky in the morning or the evening, but not in the middle of the night. Also, like Venus and the Moon, it displays a complete range of phases as it moves around its orbit relative to the Earth. Although Mercury can appear as a very bright object when viewed from Earth, its proximity to the Sun makes it more difficult to see than Venus.